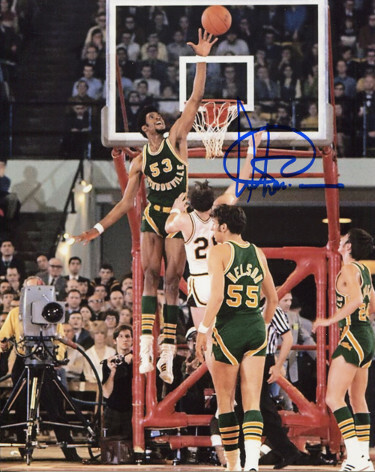 Artis Gilmore played college basketball at Jacksonville University from 1969-1970. He led the Jacksonville Dolphins team to a 27-2 record. At Jacksonville, Gilmore became one of five college basketball players ever to average at least 20 points and 20 rebounds over his career at 243 and 22.7. Gilmore led the NCAA in rebounding both years at Jacksonville, and his career average of 22.7 rebounds per game is still the highest in NCAA Division I history. Artis Gilmore has hand autographed this Jacksonville Dolphins 8x10 Photo. Certificate of Authenticity from Athlon Sports Collectibles.